Tucker's first question was, "What is the executive branch doing now to fix this [border crisis]?" Nielsen responded, "Well, uh, you probably don't have enough time for me to tell you all the things..." then proceeded to ramble about nonsense. Tucker kept asking her if she would implement specific policies such as e-verify or ending birthright citizenship and she just kept responding saying "everything is on the table." "Everything is on the table" -- but she won't actually do anything. Instead, we get non-stop buck passing as she expands H-2Bs. 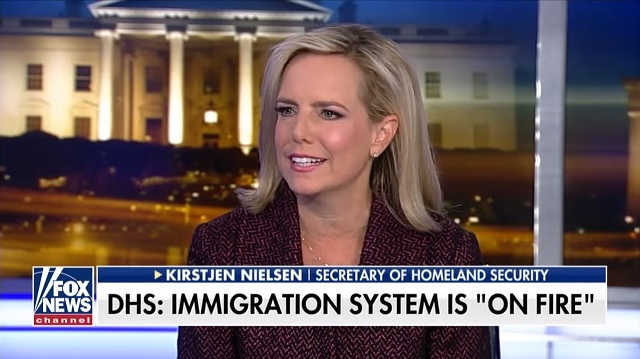 "I remain optimistic in the sense that I refuse to believe that the United States Congress will not act [on the border or asylum laws]" - @SecNielsen on Tucker tonight... yep she's optimistic Nancy Pelosi will fix our asylum laws. Though Nielsen's performance was a disaster, Tucker Carlson was on fire and absolutely hilarious. We may be getting the exact opposite of what we voted for but at least the greatest host on Fox News is pointing out what a ridiculous farce this whole situation is. There were reports on Tuesday that Trump might appoint Kobach or Ken Cuccinelli as an "immigration czar," but what is he supposed to do with Nielsen actively working against us at DHS?